Call our San Jose, CA septic tank and plumbing professionals today at (408) 933-9874, and inquire about our free estimate and 100% satisfaction guarantee. Check out our latest coupons and specials by clicking here. To see what our other San Jose, CA customers have to say about their experience working with Genmor Plumbing, Inc. for their septic tank plumbing, click here. What Septic Tank Issues Should I Be Aware Of? Septic tank problems can be quite extensive and will sometimes not get noticed right away. A septic tank issue that is left without being fixed can have far reaching ramifications around your San Jose home. If these issues are detected however, it should be something that is remedied by an experienced professional as quickly as possible. Problems that can arise with the backup of a septic system could leave you having to deal with property damage, environmental cleanup and possible contamination issues. What Warning Signs Do I Need To Be Watching For? Keeping an eye on certain things can go a long way in diagnosing a septic tank plumbing issue early on. This would also go a long way to mitigating any potential damages. Firstly, look out for sewage backup that may appear in your toilets and drains. You may notice that drains in the house seem to be moving very slowly. Your toilet may be flushing differently and seem to drain slower than you’ve noticed in the past. If you see some of these things happening in your house, check outside near your septic system for some other signs. See if there is a lot of very green looking grass over the septic system area. Check for any wastewater that may be seeping from the ground around your septic system. You may even notice that there is an odor around it or even throughout certain areas in your home. 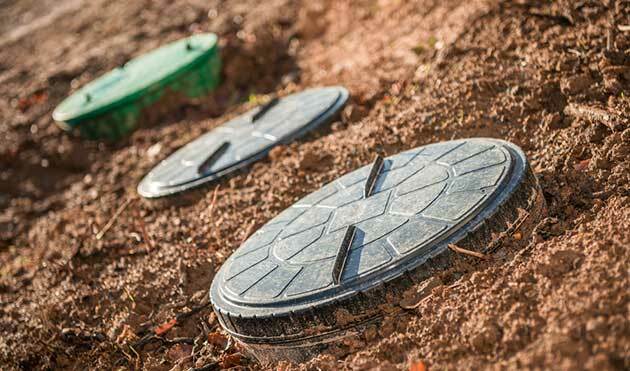 What Steps Should I Take To Deal With A Septic System Issue? If you suspect that there is a problem with your septic system, you should call Genmor Plumbing, Inc. and have a certified plumbing expert come as soon as possible. You won’t know how long the problem has been lurking as you may not have seen the signs right away. Therefore, you will want to have your drinking water tested immediately by your local health department. It is possible that your drinking water could be contaminated by sewage seeping from your septic system into your water source. You need to ensure that a professional is brought in to get your septic system problem under control and rectified as soon as possible. Property contamination, environmental issues, dysentery and hepatitis are all potential hazards that need to be avoided through fast action. Once the problem has been rectified, your Genmor Plumbing, Inc. representative can review maintenance plans with you. This will go a long way to preventing another problem in the future. Contact a licensed Genmor Plumbing, Inc. septic system specialist today by calling (408) 933-9874. One of our experts will assist you urgently. Ask about our free estimate and our Genmor Plumbing, Inc. 100% satisfaction guarantee.